The Canine Covers Ultimate Dog Bed gives Spot a comfy place to settle down while protecting your interior. The bolstered, three-sided design makes your pup feel secure while trapping in hair, "accidents", or anything that might get dragged in. Some fly by night, some fly by day. The Moonlighter® installs and removes in seconds. It's unique design carries Ladders, Pipe, Lumber and more. It fits neatly in the front and rear corners of either side of pickup bed. When the rack is removed, it leaves the truck with a Rack free appearance, no unsightly fixtures to detract from the vehicles style and overall appearance. The Moonlighter allows Ladders to be carried with vertically and horizontally. 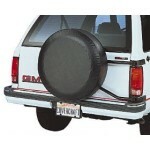 Universal Renegade XT™ Bed Rail Mount Truck Rack with 27" High Posts (81450) by Cross Tread®. Posts Size: 27". Material: Steel. The Renegade XT® is the Renegade's big brother. He's longer and extends over the cab for hauling longer items, but like his little brother, The Renegade XT is completely adjustable. Through its unique system of strategically placed set bolts and telescoping tubes, it will fit anything from a mini pickup truck to a full size pickup truck. Pictured left with Cross Guard® cab protector.